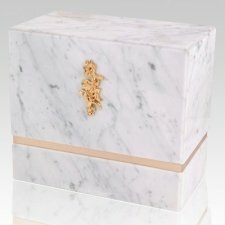 The La Nostra Bianco Carrera Marble Cremation Urn is assembled from real natural quarried stone (Bianco Carrera Marble). The urn has 24k gold plated decoration option and the bottom has felt to protect the surface were the urn stands. A wonderful natural stone urn for two people. "The urn is beautiful and the beach scene is peaceful and comforting. I looked at others, but I knew this was the one I would always be happy with. The staff was courteous and helpful with suggestions, and kept me informed as to the progress of its completion. "